We've listed about a dozen websites we created to show off what good egg web studio can do! Go Green NOLA is a Wordpress website (with a modified pre-designed template) that we created to educate the New Orleans community about building and living green. For this site, we did just about everything! 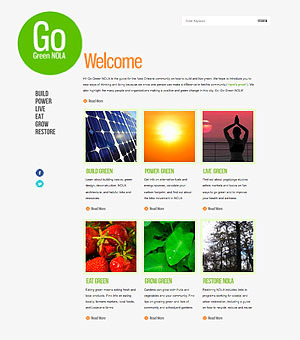 GoGreenNOLA.org highlights our ability to create an easy-to-navigate site with an intuitive information architecture filled with scannable content and visually pleasing page layouts. Most of the images and text for the site were created by us as well! Jodia is an online client and billing management system. We worked on this project while employed at Carrollton Technology Partners. Our duties included designing intuitive interfaces, creating workflow functionality and hand-coding the CSS and HTML. 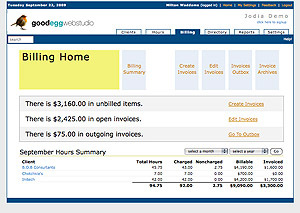 The following sections use our original visual design: clients, hours (except the filter interface), billing, and settings. 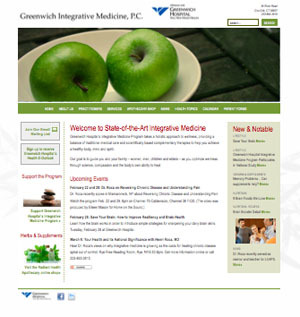 Greenwich Hospital Integrative Medicine site was an informational and educational website. We worked with the docters and staff to create a website that informs and educates patients about the programs and services available at Greenwich Hospital Integrative Medicine. We used Joomla to create an inviting, intuitive atmosphere to insure an enjoyable, informative and user-friendly experience. 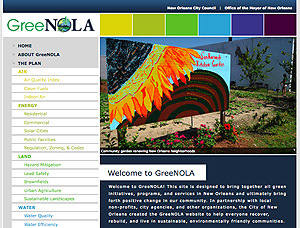 GreeNOLA was a government website promoting sustainablity in the city of New Orleans. We worked closely with Department of Environmental Affairs of the City of New Orleans to create a website that promotes and highlights sustainability programs in New Orleans. We incorporated their content into an intuitive design and hand-coded that design into a WordPress template and website. 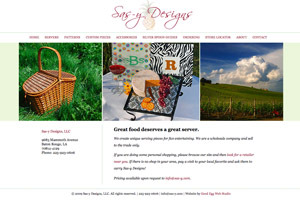 Sas-y Design is a brochure website for a woman-owned small business. We worked closely with the owner of Sas-y design to create a site which both met her needs to communicate with her wholesale clients and her desire to have a clean, easy to use website. We incorporated her ideas in the design of the site and hand-coded that design into a WordPress template and website. 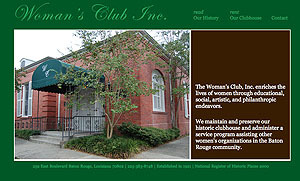 Woman's Club Baton Rouge is a brochure website for a non-profit organization. 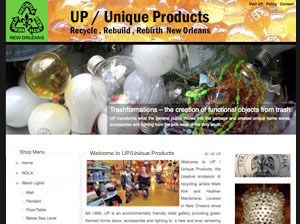 UP/Unique Products is an e-commerce website for an art/crafty business. We worked closely with the clients to create an e-commerce website that fit into the funky and fun design of their artsy products. We used Joomla to build the site, hand-coded the layout of all the pages and help the client define the structure of the website. We also provided training and materials to the clients so they could maintain the site after we created it. 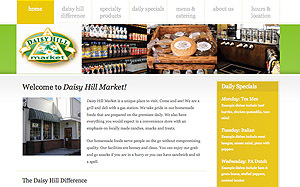 Daisy Hill Market is a brochure website for a small business. We worked closely with the clients to create a brochure website that highlights their unique, gourmet take on the traditional convenience store. We showcase their daily meal specials and local specialty products (We would have gladly taken our payment in lobster bisque. Yum!). Shop Le Weekend is an e-commerce website for a woman-owned small business. 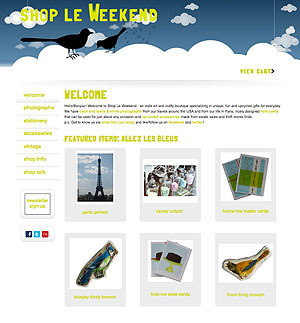 Shop Le Weekend is a Joomla website with which we have a special connection. We created all the content including, logos, merchandise displays, and images. And, for this website, we were both client and web designer/developer as this site is for our other business...we also make all the items for sale. We would definitely hire us again! 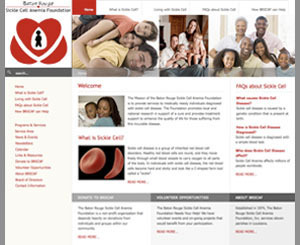 Baton Rouge Sickle Cell Foundation is an informational site for a non-profit organization. The goal of the website is to inform and educate the general public and patient population about the sickle cell disease and the resources available at Baton Rouge Sickle Cell Foundation. We used Joomla to create an inviting, intuitive atmosphere to insure an enjoyable, informative and user-friendly experience. 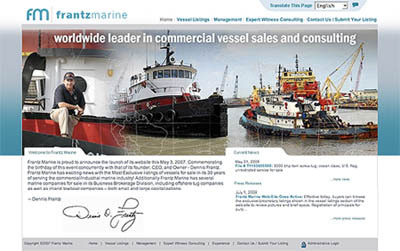 Frantz Marine is a brochure website that also lists the company's boats available for purchase. We worked on this website while employed at Carrollton Technology Partners. For this website, we created a wireframe with both interface and design elements that the designer used to create the graphics for the front page. We designed and programmed the layout of all the admin pages that the client liked so much, he wanted them used on the front-end internal pages.